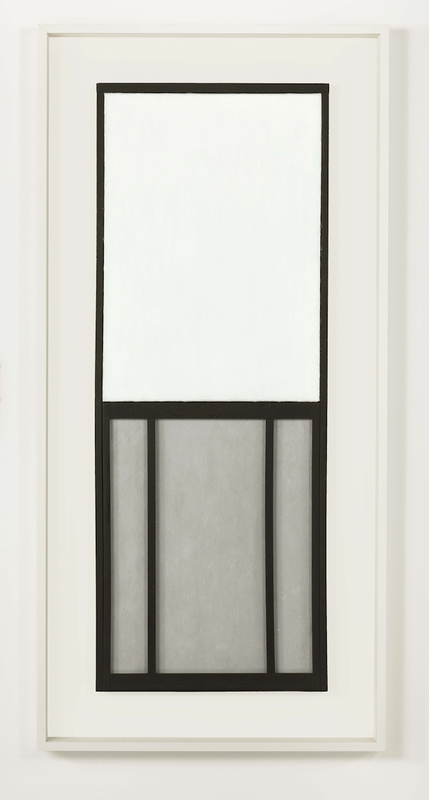 Ellsworth Kelly, Window, Museum of Modern Art, Paris, 1949, oil on two joined panels of wood and canvas, 50 1/2 x 19 1/2". Photo: Hula Kolabas, courtesy of Ellsworth Kelly Archives. CERTAIN ARTISTS TEACH. Every time I encounter a painting by Ellsworth Kelly, I learn this lesson again: A painting is not just an image, or even an object; it can also be a kind of architecture. I’ve always felt a compulsion to look closely at the edges of Kelly’s paintings, carefully examining the various ways in which he continues the painting beyond its front edge. Each time I lean into a wall in an attempt to look behind one of his works, I am left with the sense that even though I can see the way he has built the painting, I still do not fully understand how it is that the painting appears to be not quite in the same room that I am in. Many twentieth-century painters put forth the framelessness of the canvas in order to expose the furthest frontier of paint, emphasizing the border between support and the action that takes place on it. But in Kelly’s work, the lack of obvious framing device reveals something different: It is as if the painting continues on, toward the invisibility of what is behind it. Sometimes this manifests itself in that the color simply continues seamlessly around to the back of the painting; equally intriguing are the works made in parts, not diptychs or triptychs and so on, but rather paintings where the image is created as a construction, assembling distinct elements directly abutting one another, edge to edge, though not completely joined. I have often found myself pondering the same mystery: Just how is it that he creates the sense that the painting is not confined to its own dimensions, its own boundaries? Even though each work ends sharply, as it were—in a hard edge where a frame should be—its shape somehow does not end the painting but rather emphasizes that the world it depicts continues on independently of what I can see in front of me. Recently, I have felt like I have understood a little more, particularly during the process of making an homage to Kelly’s “first object,” his marvelous 1949 painting Window, Museum of Modern Art, Paris. His painting has a winning self-reflexiveness: Not only is it a picture of a window, but it is built like a window. (My attempt at revisiting this work was constructed as a reverse window, using mirrors to create an object that looks back at you instead of offering a view out.) It is in fact a piece of architecture, made using separate parts for the dark window frame and for the glass panes; most significantly, it is divided in two sections vertically, like a casement. Here, frame is both place and an image of place, an orientation and indication of where he saw from and where we see from. The frame, image, and object all become one thing, propping one another up. Many of his works resonate in great part because of the way that they carry these investigations further, from Sculpture for a Large Wall, 1956–57, which looks like the windows of a building, to his monochromatic panels, each of which is like a window into whatever wall they hang on. Window is typically seen as a break or rebellion, a “blow he had dealt the pictorial tradition,” as Yve-Alain Bois puts it. I find this hard to understand: To me, the painting teaches us just how apt the Renaissance metaphor of painting as window still is, how it is perhaps even more important as a poetic construct today. If the function of a picture is to provide clues to how we might look, as an act of engagement with what is outside ourselves, then the frame, as photographers have always known, is what makes it possible to see the world not as a reflected in the inside of the eye, but as image of a reality outside the body. In other words, framing is seeing. It was one of Kelly’s gifts to show us how we can never leave the frame behind, but we might incorporate it, in every sense of the word. Josiah McElheny is an artist based in New York. For additional tributes to Ellsworth Kelly by Yve-Alain Bois, Richard Serra, Ann Temkin, Terry Winters, and Mary Heilmann, see Artforum's April print issue.